First, let’s take things back to basics. To make pancakes you need three basic ingredients, eggs, flour and milk. You also have the option of adding a little baking powder to raise the pancakes a little and make them a little more fluffy. Some form of fat is needed for the pan at least. Which brings us to utensils. A frying pan and a spatula are the main tools you need. 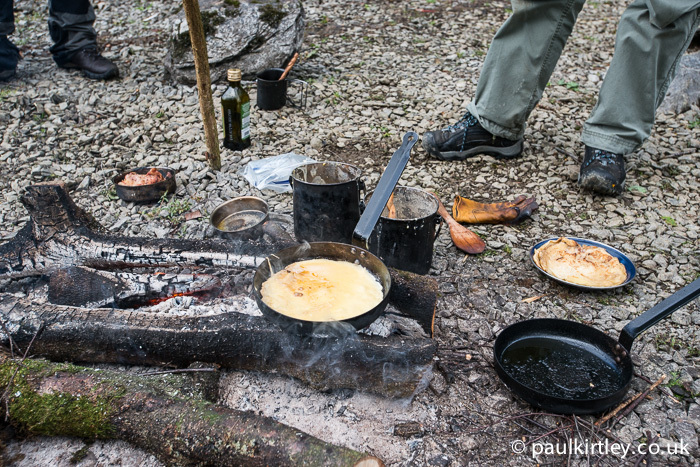 In camp I’ll mix the pancake mix in a spare stainless steel cooking pot or billy can. I don’t usually carry a whisk. A serving spoon will suffice to mix the ingredients and beat the pancake batter. 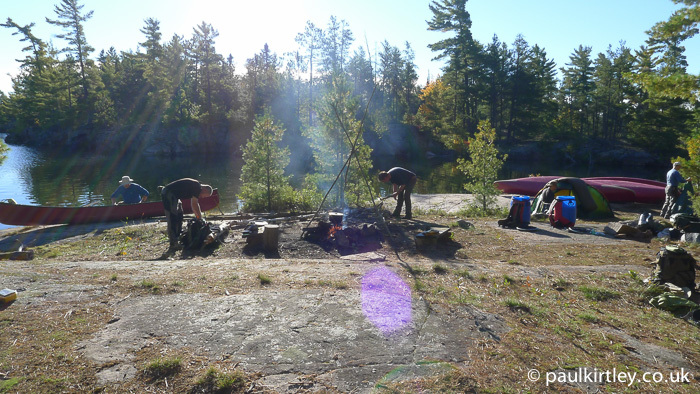 Pancakes make for a great start to the day on canoe trips. But you are unlikely to have all the fresh ingredients you enjoy at home. Photo: Paul Kirtley. At home, we’d use fresh eggs and fresh milk to make our pancake mix. If you are living in a fixed camp, or making a vehicle based trip, then you might have fresh eggs, at least to begin with. Less likely is fresh milk. UHT milk stores for a good amount of time and can be used. Otherwise, use powdered milk. You have two options with powdered milk, to mix the powder in with other dry ingredients before adding water, or to mix the milk powder with water then add this to the pancake mix. I prefer the latter as it provides more control over the consistency. So mix the powdered milk as per the instructions on the packet or tub. See below for amounts. If you can’t carry fresh eggs, then you will have to resort to powdered eggs. These work perfectly well and I always try to add them on canoe trips in Canada, where powdered egg is easy to come by, even in camping stores. In other countries, powdered egg is a lot harder to find. Going back to basics my recipe for pancakes is as follows. One handful of plain flour per person. Enough milk to create a mix which is the consistency of single cream. OK, on the face of it, this pancake mix is a little vague. But I’m preparing you for camping situations or expeditions here. We don’t take kitchen scales with us. In terms of measuring jugs, the nearest we’ll probably have is a metal mug with a couple of volume measurements on the side. The way we apply the basic pancake mix is to add the flour to the mixing container. Then crack the eggs into the flour. Mix with a spoon. This will make a solid dough. Then start adding the milk, mixing as you go. Break the dough down with the spoon and start to beat the mix as it becomes thinner. There will be lumps. Squash these against the side of the mixing pot with the base of the spoon. Some small lumps won’t be a problem, but do your best to squish as many of them as possible. Keep adding the milk until you have a batter the consistency of single cream. That’s single cream, not double cream. So, you see this basic recipe can be applied whether the base ingredients are fresh or all powdered. If you are using powdered egg and powdered milk, do the following. Look at the powdered egg packet and work out how much powder is equivalent to one egg. Add this amount per person (i.e. one egg per person). Add one handful of flour per person. Mix this dry mix of egg and flour before adding any liquid. If you are going to add any baking powder (no more than a teaspoon per 6 people), mix this into the dry mix too (dry ingredients should always be mixed before adding liquid). Mix the powdered milk with water in a separate container as per the instructions on the milk packet. Stir in the milk to the egg-flour powder mix until it is the consistency of single cream. You can use vegetable oil, oilive oil, coconut oil, butter, suet or lard to make pancakes. You need most of it for the pan, to stop the pancakes sticking as well as to add a little flavour. Personally while I love olive oil in general, it’s my least favourite option for pancakes unless I’m making savoury pancakes. Butter is by far the best tasting fat to use with pancakes to my palate. You should melt some in the pan and drain off the excess into a metal container which you can keep near the fire to keep it liquid. I find the insert of a Zebra billy can ideal for this but there are of course many other options. 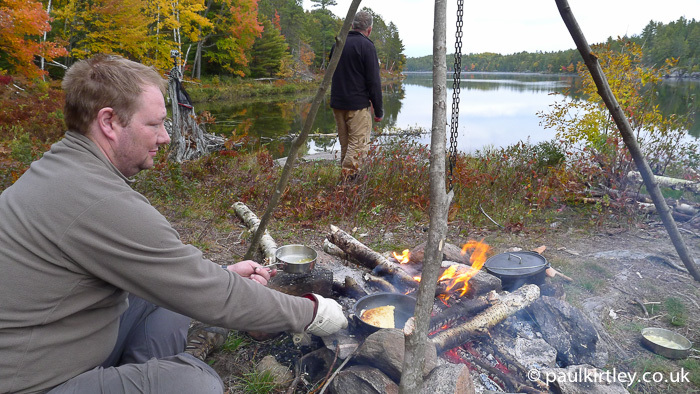 Malcolm on pancake duty on one of our French River canoe trips, Ontario, Canada. Note the small Coleman pan lid in his left hand, holding melted butter. Photo: Paul Kirtley. The secret to good campfire pancakes is to melt a good-sized knob of butter, then add it to the pancake batter before you start cooking any pancakes. Mix the liquid fat into the batter mix. I have Delia Smith to thank for this idea. It works particularly well on a campfire when using black iron pans, which we do on a regular basis as they are indestructible. On trips where we need a lighter-weight or more compact solution, we use the GSI Bugaboo frypan. It’s easy to burn pancakes. You need a good bed of embers onto which you can place your pancake pan or a lick of flame but hold the pan further away. Add the pan to the heat. Add some butter and ensure the whole pan has a coating. Pour off the excess into the reservoir you are keeping warm. Add a little batter – an eating spoon full for example – to make sure the pan is up to heat. Once the small amount of batter has solidified, remove this and add a full pancake quota. My measure for one person is a standard ladle full. This gives a decent pancake in a 10”/250mm fry pan. You should get a couple of pancakes per person out of your standard mix. Add this to a few rashers of bacon and some maple syrup, along with a mug of coffee, then you are well set for a day of activity. 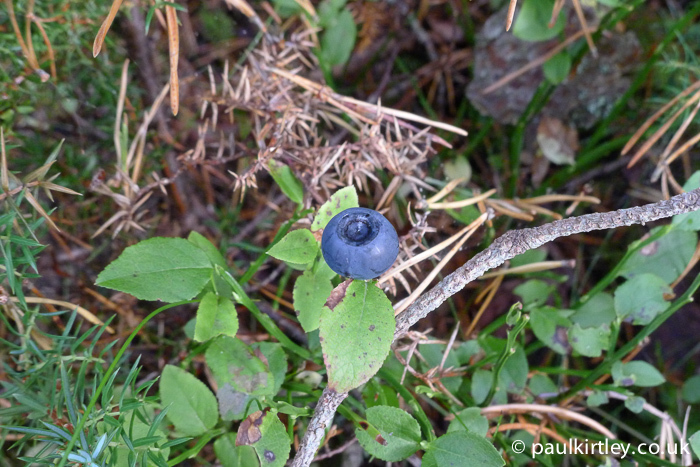 Other great alternatives include adding some foraged blueberries or blaeberries. You can certainly pre-mix the dry ingredients and bag them up ready to go for each breakfast. 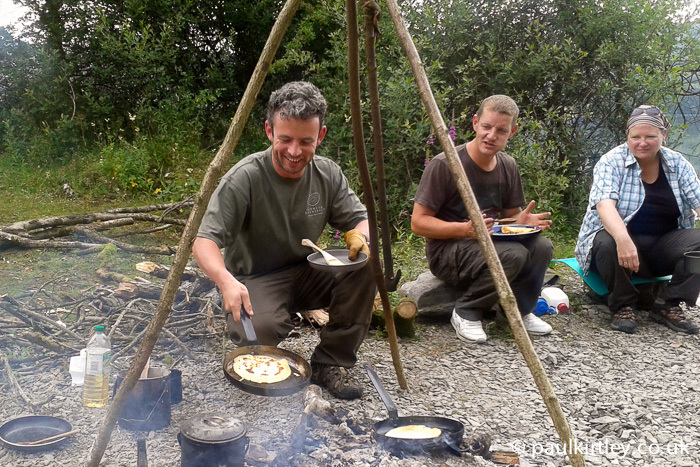 When you have a fixed menu, strict weight considerations or limited time in camp, this approach is ideal. Otherwise, flexibility of menu is also valuable. Personally, on longer trips I prefer to carry dry ingredients separately. Flour, baking powder, suet and powdered eggs allow you to make everything from flat breads, through bannock, pan breads and pancakes. If possible within the parameters of the trip, I like the flexibility to make what we feel like eating in the field, rather than pre-determining the exact menu at home, before leaving. Nice recipe, I add a pinch of sugar to the mix and a drop of vanilla extract. The sugar dissolves in the mix but helps give your pancake better colour and that hint of caramel. I usually mix mine in camp in a nalgeine bottle shaking the bottle mixes’ the batter and adds air keeping it lighter. Can’t go wrong with sugar and lemon. Have you any top tips for carrying butter in your rations without resorting to some type of clunky plastic container. Have a great PANCAKE DAY mate. Unfortunately you cant fry with this, according to the guy in the vid. Thanks for this Recipe! This tasty food is similar to Bannock Bread which is an all-time fave for Bushcrafters & Mountain-Men alike… Really love your Outdoor Wisdom! Have you found a source for powdered egg in the UK..? Decades ago it was available like powdered orange, but not seen either for a very long time. I’ve not seen it in regular stores for a long while. Catering suppliers sometimes carry powdered egg but not always in packet sizes we’d like. Clarified butter keeps well when temps are high. Butter buds? Don’t think I want to add that after learning that margerin and veggtable shortening is doing is in. I grew up learning to cook by measuring cup, wile mom and my aunts cooked by hand and eye. So I am fairly versed in both. The years have taught me to baseball bread making on 2 cup modules. Tho I would normally consider Master Kirtlley’s pancakes egg heavy, is this case they act as the primary leavening. The first bread recipe I know of comes from the bible and includes flour oil and salt. The start of about any bread. Buy using a system of “modules” you can keep the recipes in your head. Flour tortillas, corn tortillas,Yankee and southern cornbread, pancakes, johnycakes, hoecakes, biscuits, banoc, damper, ash cakes, etc. all from flour (or meal) water, most likely oil and salt. Eggs and milk optional but most welcome! Find your self with out baking powder? The clean white ashes from your fire make a good substitute, and learning to keep a sourdough starter/sponge will add to your bread joy. At my scout troop we made a hot plate and then had an open fire under. it was a great success. Sounds great Alan. Does the hot plate have legs or do you suspend it in another way? The plate has lugs on either side to allow it to best rested on half a 45 gallon drum. this stops it falling into the drum and also shields anyone using it from the fire. Hi Paul, just wondered where you get your black iron pans from? In the past I’ve bought them from Nisbets. They are inexpensive and last very well. Very nice recipe, it looks like a sweeter version of bannock and I think it is more suitable as breakfast time. 6:35 AM, I burn the first batch of pancakes. 6:36 AM, my long time canoeing friend Bob Juckins take over from me. Haha, brilliant Paul, thanks for sharing. You are indeed a selfless man. Everyone knows the first pancakes are rubbish, whoever makes them. I’m impressed you take the fall each time, with no ego.